Does Natural Color Vary from Batch-to-Batch? Visual consistency is critical for food and beverage brands, especially the color, as it instantly constructs flavor and quality cues for consumers. Color cannot only affect flavor expectation, but it can also alter a consumer’s experience with a product. Research from Dr. Francis McGlone, Head of Somatosensory & Affective Neurosciences and Psychology at Liverpool JM University and former lead Neuroscientist at Unilever, indicates perceived flavor intensity can be strongly influenced by color. An additional study published in The Journal of Consumer Research conducted by two distinguished marketing professors, JoAndrea Hoegg and Joseph W. Alba, concluded similar findings as McGlone. Their research evaluated consumer preference for orange juice at varied levels of color vibrancy. In this study, consumers “succumbed to the influence of color,” as the brighter, more authentic orange shade was preferred for its taste, when in fact, both juices were the exact same, just different colors. The saying “people eat with their eyes” is undoubtedly very true, and color is arguably just as important as taste. 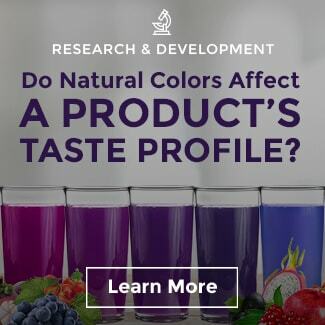 While there is a great deal of research demonstrating the effect of color on flavor perception, up until now, there has been little investigation over the impact of color on purchase behavior. Sensient recently conducted a large scale consumer retail study to better quantify the value of color. We tested eight different categories, and our results indicated a statistically significant increase in both purchase interest and overall liking in the brighter, more vibrantly colored product concepts. 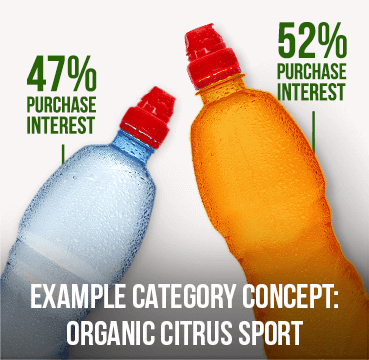 The difference between the two purchase interest percentages might look very small, but when equivocated to dollar sales, they become quite large. What’s also interesting is our findings were also similar to the results of McGlone’s and Hoegg’s/Alba’s. Greater color intensity was associated with better taste and more flavor in 89% of the products tested. If taste is king, then color is its queen, and they very much work hand-in-hand to win consumers over. When color can be a differentiating factor in overall dollar value, visual consistency becomes a major priority and should never be compromised by the use of natural color. There are unfortunately misconceptions out there about natural color quality and consistency from harvest-to-harvest. We want to set the record straight for all product developers and food scientists. The truth is brands should not have to endure color variation in their finished products due to batch inconsistencies from color suppliers. Standardization procedures remove the halo of uncertainty around natural raw materials and extracts coming from different crop cycles and geographic locations. In addition, the analytical testing and technology available today ensures all purity and safety specifications are met of each color batch. Shade expectations should not change when formulating with colors from plant sources. 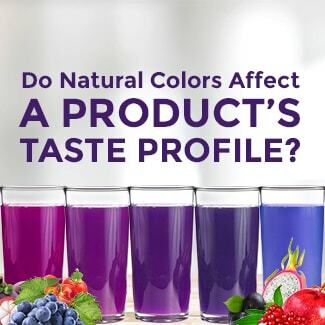 Wondering if natural color affects a product’s taste profile? Learn the truth about this natural color myth here.